Jazz is a musical style native to the United States, that emerged in the early Twentieth century. Jazz was influenced from Blues music, which was established most notably by W.C. Handy in 1917. Jazz has new sound that incorporates both the African American musical stylings and the European American form of music. This hybridization of the two heritages created a unique style of music which we now call under a big genre “umbrella,” Jazz. 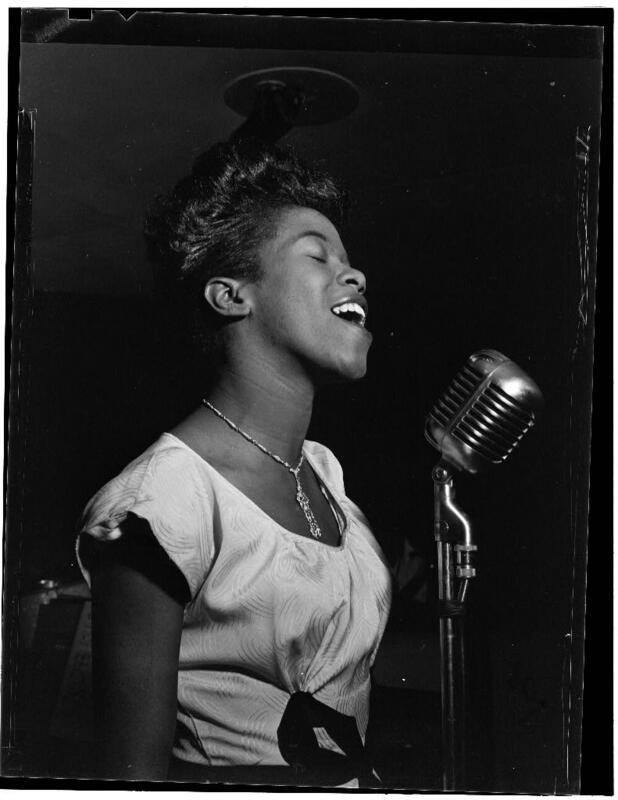 In the Library of Congress photo archives, a photo of the reputable Sarah Vaughan was present among many photos of white jazz singers. She became popular in the late 40s and early 50s when Jazz was really hitting it’s stride as popular music, with the likes of Frank Sinatra. Vaughan was highly influenced by the early blues style, of W.C. Handy. Handy’s invention or development of the Memphis Blues, drew on the folk style of the old southern plantation music. The emotional context of this music is heard in the vocal stylings of the renowned Sarah Vaughan. The memphis blues eventually took shape to the 12-bar blues, which also led to the development of Jazz. While Vaughan represents a big part of the Jazz era, more commonly was the presence of white artists, such as Doris Day, Peggy Lee, and Sinatra. They emulated the sounds of a soulful Vaughan, singing on topics that go back to the days of slavery. “St. Louis Blues” is a great example of an old dixieland jazz band song that evolved over the years. In the recording provided in the above link, the instrumentation, while has elements of a traditional jazz band also still has southern sounds to it… likely from New Orleans. 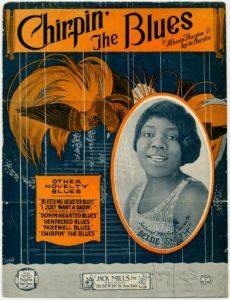 In the video below, the song is presented in a different style of blues and jazz, one that emerged later with artists like Bessie Smith, Louis Armstrong, and Sarah Vaughan. Gottlieb, William, photographer. “Portrait of Sarah Vaughan in Café Society (Downtown).” Photograph. New York, N.Y.: Library of Congress Prints & Photographs. Aug. 1946. Online.